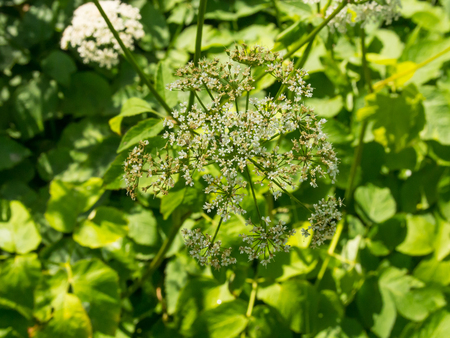 Aegopodium podagraria (commonly called ground elder, herb gerard, bishop's weed, goutweed, gout wort, and snow-in-the-mountain, and sometimes called English masterwort and wild masterwort) is a perennial plant in the carrot family (Apiaceae) that grows in shady places. The name "ground elder" comes from the superficial similarity of its leaves and flowers to those of elder (Sambucus), which is unrelated. It is the type species of the genus Aegopodium. This species is native to Eurasia, and has been introduced around the world as an ornamental plant, where it occasionally poses an ecological threat as an invasive exotic plant. A. podagraria is perennial, growing to a height of 100 cm (39 in) with rhizomes. The stems are erect, hollow and grooved. The upper leaves are ternate, broad and toothed. Numerous flowers are grouped together in an umbrella-shaped flowerhead known as a compound umbel. The main umbel is further divided into several secondary umbels known as umbellets or umbellules. Each umbellet has 15 to 20 rays (pedicels) that are each topped with a single, small, five-petaled white flower. The fruits are small and have long curved styles. The flowers are visited by many types of insects, thus being characterised by a generalised pollination system. Aegopodium podagraria is distributed widely in the temperate zone of western Eurasia, from France to northern Russia. It has been introduced elsewhere, including Ireland, Great Britain, the United States, Canada, Australia including Tasmania, New Zealand, and Japan. A. podagraria has been introduced around the world, including in North America, Australia, New Zealand, and Japan, most commonly as an ornamental plant. It readily establishes and can become naturalized in boreal, moist-temperate, and moist-subtropical climates. It is an "aggressive" invader in the upper Great Lakes region and northeastern North America, Australia, Tasmania, and New Zealand. It can pose an ecological threat due to its invasive nature, with potential to crowd out native species. Because of its potential impacts on native communities and the difficulty of its control, it has been banned or restricted in some jurisdictions outside its native range, including in Connecticut, Massachusetts, Wisconsin (see Administrative Code NR 40), and Vermont in the USA. Once established, goutweed is difficult to eradicate. The smallest piece of rhizome left in the ground will quickly form a sturdy new plant. All-green goutweed may be more persistent and spread more rapidly than ornamental, variegated goutweed varieties, making the all-green type particularly difficult to control. And all-green, wild type forms are known to reappear from seeds of variegated varieties. In Eurasia, it is used as a food plant by the larvae of some species of Lepidoptera, including dot moth, grey dagger and grey pug, although A. podagraria is not the exclusive host to any of these species. The plant is said to have been introduced into Great Britain by the Romans as a food plant and into Northern Europe as a medicinal herb by monks. It is still found growing in patches surrounding many monastic ruins in Europe, and descriptions of its use are found among monastic writings, such as in Physica by Hildegard von Bingen.